Ask fellow campers about "Fort Pickens Campground" and nearby attractions. Question: FYI to everyone. Ft Pickens Campground at Gulf Islands National Seashore, Pensacola Beach is closed until December 3, 2017. This is due to road damage from Hurricane Nate. The NPS Gulf Islands website has a press release on this event. 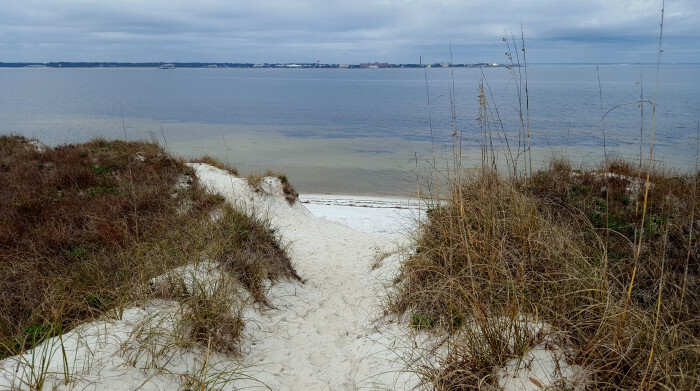 Campground was clean and within walking distance of both the Gulf beach and Pensacola Bay. Be sure to plan time to visit the fort. I visited after leaving my campsite the last day. We camped at Fort Pickens Campground in a Motorhome. Loved camping here. We camped in a 40' fifth wheel and getting into our site A20 was a little difficult but this inconvenience was overshadowed by the beautiful beaches and the Fort. Beaches were clean and not crowded. Blue Angles practice on Tuesday and Wednesday. It was a real treat to watch them while enjoying the beach. Can't wait to go back. We camped at Fort Pickens Campground in a Fifth Wheel. Good restaurants on the beach approx 8-9 miles from camp. Downtown Pensacola has many restaurants, shops, art museum, etc and worth the drive. Saenger Theater has lots of good productions. Very level concrete pad site. We had no shade so you'll be warm in cooler months. There is shade in many sites so let the park rangers know that you need shade if you're in tent or pop up. 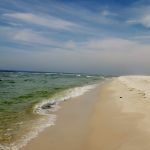 We stayed as a one nighter waiting for our site to open at Pensacola Beach RV resort and we were very grateful to be able to reserve this site through reserveamerica. We camped at Fort Pickens Campground in a Motorhome. We Love this park being so close to the white sand beaches. The park is well kept and taken care of. Long drive at 25 mph from park entrance to the campground. All park employees we encountered were friendly and helpful. Some sites looked like they could be too tight to get a big rig into due to trees in the way. We had problems opening our slide on our 21 foot travel trailer due to a low hanging branch and had to park with the tires on one side hanging off of the pad besides at a diagonal angle. Site A 28 not made for slides. We camped at Fort Pickens Campground in a Travel Trailer. This park turned out to be a bad choice for us in a 40-ft motorcoach. Site 16A was plenty long enough but we couldn't get into it because of trees on 3 of the 4 corners next to the road. We scratched the coach. Then the park relocated us for one night to site 30. It was okay (except the electrical unit get blowing out) but we could only have it for one night. They tried to place us in site 31 the next two nights, but although the website said the site would hold a 43 foot coach, it left the front end of the coach right at the edge of the road. That might have been okay--but it was on a corner and other people couldn't make the turn without backing up a few times. We were afraid of being hit, so we left the park after one day. The interior roads are too narrow, especially the corners for large units. That said, the beach is gorgeous. We watched dolphins frolic on our beach walk. We camped at Fort Pickens Campground in a Motorhome. My needs are simple: power, shower and running water and this site delivers. I stayed three nights. Some people might not like the slow 25 mph drive for miles along this barrier island to get to the campgrounds but for me it was part of the charm - by the time you arrive you feel like you're farther from civilization than you really are. About half the sites are shaded and I was in the other half, but with a steady breeze and temperatures in the 70's and low 80's the climate was ideal. I'll be back. We camped at Fort Pickens Campground in a Motorhome. We (my wife and I) had an awesome time at Fort Pickens Campground. Our site had no shade; however, it was perfect for the low 70's and windy weather. Would definitely prefer a shadier site if in the mid 80's and up. Short drive to Langdon Beach which is on park property. Pavilion with plenty of tables and bathrooms. Unfortunately, no shower or hoses to hose sand off feet and legs. Short walk to beach from parking lot. Not crowded during the week. Saturday had more folks but nowhere near the numbers of most "public access" beaches. Bathroom/bathhouses are very clean and actually had private shower rooms. Some sites had older picnic tables while others had newer picnic tables. Sites along outer perimeter appear to have more shade. Quiet for the most part. Would prefer bigger site to allow for parking vehicle on site but "overflow" parking was close by. We have already booked our next stay in September. We camped at Fort Pickens Campground in a Travel Trailer. Flounders and Crabs were very good restaurants. The old fort and discovery center is a must do. Langdon Beach facilities and access were great. We have been camping here for 20 years, minus the hurricane closures. Up to now it has been good. This trip we encountered new unpublished rules that will probably halt our future stays. This is a "beach" campground. It is now against the rules to string clotheslines from the trees. There is no place to hang your beach towels. The store closed last year and shows no sign of ever opening. There is no laundromat here, the closest is in town, several miles away. The tent campers are not allowed to wash their dishes and dispose of the dishwater in the bushes behind their campsites, and there are facilities @ the bath house for this that are locked up.They have raised the camping fees to $40 per night for campers with no golden age passport. It was $20 a night 5 years ago. So sorry that they have made it into a place that is now too expensive for what they have to offer. We camped at Fort Pickens Campground in a Motorhome. Pensacola Beach has become quite the tourist town. Several restaurants and stores to visit. The traffic can get crowded at times, plan your visits with this in mind. We would not recommend this park to anyone with a 36ft or greater RV. We were on 3 different sites, A, C, and E loops. None of the sites provided us enough space to park our tow car on our site. There is inconvenient overflow parking. The roads are very narrow around the park and many of the trees have low hanging branches you must dodge while maneuvering around the many cars parked at the road edge making it very difficult to back-in to your site. We backed our 40ft motorhome in as far as the curbing would allow. Our rear levelers were on grass beyond the curbing on all the sites we stayed. On the E loop our mirrors barely cleared the road. We recommend you carefully read the online site size information and look at the photo of the site. The information stated our sites would accommodate a 40ft RV. That was a stretch--they were much to tight for our liking. The space between sites were decent on most sites. We found the office staff to be "all business" and a bit unfriendly. Expect to have your ID and NP pass available daily. The beach location of the park was great but we would not return here. We camped at Fort Pickens Campground in a Motorhome. We enjoyed 5 nights here in loop E in a back in site. Parked our truck in overflow parking since space at most sites is limited. Really liked the campground and facilities were clean. Interior roads were tight with people and/or trees in the way trying to park and navigate. The campgrounds 50 amp at our site didn't work when we arrived and with it being a holiday weekend it took a few days to get working (we used 30 amp). We are planning to return shortly. Verizon service worked well and we got several OTA tv channels. $20 fee to get in the National Seashore unless you have the Federal pass. We camped at Fort Pickens Campground in a Travel Trailer. Try out Red Fish/Blue Fish, we liked it better than Peg Leg Pete's. Our site was in Campground E, located in the same area as C & D. We received the senior pass discount and had reserved before the recent rate increase to $40/night for a site with water and electricity (non-discounted price). We always enjoy staying in Fort Pickens. There is easy access to great beaches and the historic sites are fascinating. The campgrounds themselves, unfortunately, have suffered through recent hurricanes and a good chunk of the trees and vegetation is gone, so there's not a lot of privacy in most of the sites. (Campground A is marginally better in this respect.) The restrooms and showers are clean and well-kept; hot water is variable, though. (A side note: we stayed there during sub-freezing weather. This may have affected hot water supplies.) The site lengths specified for sites on Recreation.gov are optimistic, so if you have a big rig, be careful which sites you reserve. Pros: Staff and campground hosts are very friendly. Good comfort stations. Great location. The beaches are spectacular and uncrowded. Good OTA TV, and no problem with Dish satellite reception. Cons: Camp store is closed until further notice, which means no access to laundry facilities either. Plan on at least a half hour drive to get to stores and restaurants. Campground can close on short notice if roads are in danger of becoming sand-covered. Campground roads are a bit tight, as campers tend to park a little too close to the road. We camped at Fort Pickens Campground in a Motorhome. Beautiful campground!! Can't believe they had availability. The beaches, the views... breathtaking. Love the whole campground. You are in nature. There is a dump station right in the park so very convenient to dump before you leave, but not a hookup at your site. We camped at Fort Pickens Campground in a Fifth Wheel. Let me start by saying the three stars is not a reflection per se of the campground, but of the campground sites based on the use by a 40 foot class A motorhome. Even though there are numerous sites that say they are suitable for this size motorhome, the one we were in was barely big enough to fit the motorhome without sticking out into the small narrow interior roadway. Trying to back into the site, with everyone parking barely out of the roadway, or even protruding into the roadway was a huge challenge. I almost got the coach stuck trying to get into this site. I did find about 6 to 8 sites in the campground that would fit a 40 to 43 footer with room to manuever into the site, so choose your site very carefully if you have a big rig. There also seems to be very little regard for the 5 mph speed limit on the interior roads. We had people running at least 25 mph through the campground. We love the location of this campground, and the staff were very friendly. The bath houses and restrooms were very clean and one had recently been upgraded. The laundry room was closed, so don't know about it. We will probably go back at some point in the future, but I will be very selective about which sites to book. You can not go by the information on the web site. We camped at Fort Pickens Campground in a Motorhome. Beautiful beaches, neat touring the old fort. Pretty good restaurants within a short drive. This is our favorite campground. Loop A is the best of all the loops to stay in as it is the newest Loop. The Restrooms have been updated and were spotless when we used them. The Campground registration office employees were very nice and helpful. The beach is walking distance from the campsites and not crowded at all. We camped at Fort Pickens Campground in a Travel Trailer. Campground store is closed. If you need groceries go to Publix in Gulfbreeze. Nice park. Some spots are shady, others full sun. We were full sun. The restrooms were very well lit, but not air conditioned. It gets hot in there, but since there is no sewer hookup, we used the public restrooms. The fort area is nice and the beach is beautiful. You are not supposed to park on the grass and there was not quite room for our truck to fit fully on the pavement. We camped at Fort Pickens Campground in a Travel Trailer. Bring a grill. The fire ring doubles as the grill, so it is pretty low to the ground and not a huge cooking surface. The camp store was closed during spring break which was a bit of a hassle since we don't have a toad so couldn't go into town to get supplies. In spite of the draw backs this is the perfect beach campground. It is very relaxing to just sit on the gorgeous beach and watch the ocean all day long. Was not bored at all. We will definitely stay here any chance we get. To fit our 45 foot motorhome, we had to park our tow vehicle in overflow parking. The overflow parking was pretty close. Easy to spend time biking, beach walking, and visiting the Fort. We would try to book the A loop in the future. Park at one of the batteries between the campground and the fort and walk to the beach from there. Beachgoers should fully understand rip currents. Serious sunburn possible in white sand. Most people who drown are from inland states. If you cannot swim, just wade. Many good restaurants, bars, recreation areas at nearby Pensacola Beach. Sales taxes are higher on the Beach than in Gulf Breeze or Pensacola. Downtown Pensacola (Palafox Place) is tops with regards to fine dining, sidewalk cafes, nightlife, festivals, year round sports. 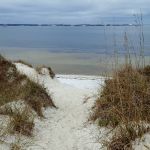 The Florida National Scenic Trail passes by or through all campground loops and goes out to Fort Pickens and to southern Florida in the other direction. Bike friendly. 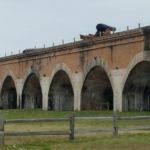 Fort Pickens is interesting for history buffs, and the beaches and woods are excellent. Take whatever food and libations you like as there little in Pensacola Beach. It is eight miles into the island stores and 12 miles with a one dollar toll into Pensacola for decent grocery shopping. Hint: buy booze before arriving as it is very expensive there. Located at the entrance to Pensacola's harbor, you will see many boats of all shapes and sizes. Across from the fort, you have a great view of the Pensacola Lighthouse. If you are into military aircraft, this is the place to be. Across the harbor is Pensacola Naval Air Station, which provides an excellent vantage point to watch the Blue Angels (this is their home base) on the days they're flying. Also, you will see Navy trainers and other military aircraft flying. Camp store in walking distance but advis you to bring inenough groceries so you don't have to drive out of area. Very close to Pensacola NAS. Sometimes the Blue Angels practice right off the Beach! We got to watch the Blue Angels practice right from our beach chairs on the Gulf Beach. It was one of the coolest experiences we have had. Pegleg Pete's on the road in was a great place to eat. Their crab claws were excellent. Navy museum. Try to schedule during Blue Angels practice check their website for times. The very best key lime pie can be had at Flounders Chowder House. The price is $8 for what ends up being the equivalent of 3 pieces. We went back and carried out three different time. It was heavenly. Put a piece in the freezer and it is even better. The Naval Aviation Museum on Pensacola NAS is simply outstanding, and is a must-see. The 150+ aircraft on display are all in museum-quality condition. Allow a full day to visit this museum; admission is free. The National Cemetery on Pensacola NAS is also worth a visit to reflect on the many service people who have served our country. 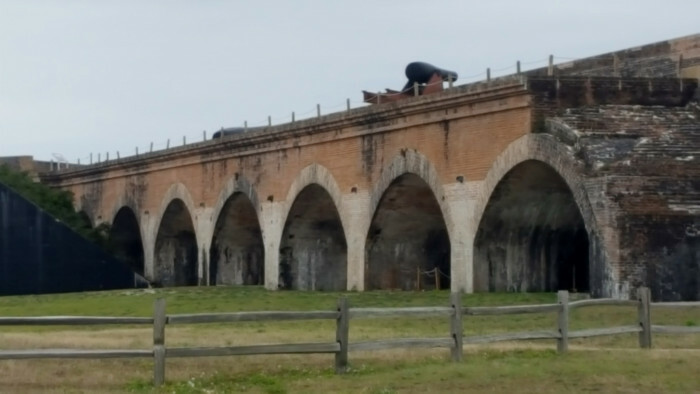 Fort Pickens has an interesting history over the centuries and is definitely worth a visit. 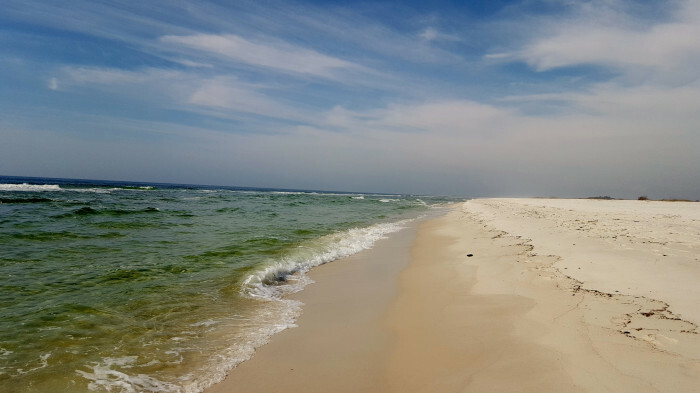 Great access to Panama City Beach but without the hassle of crowds where you stay. Easy shopping and dining just across the bay. Access to historic Ft. Pickins and the ability to see the Blue Angels practice at times. We drove to wonderful food coop in Pensacola called Everman, shopped at island Publix. We found restaurants in area to be mediocre at best, so shopped for irganics & did our own cooking. Beautiful white sand beaches a short walk away. Peg Leg Pete's has daily M - F happy hour on draft beer from 3 - 6. Wednesday they have 69 cent oysters. Also very good Grouper. Bring a tote for grey water and avoid shower house if possible. They're pretty clean but crowded. Look for the beach parking by Fort batteries. Beaches there are almost empty. 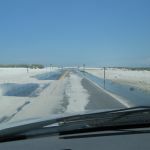 Are you affiliated with Fort Pickens Campground ?